Barber Clippings: Forty-Eight Years Ago! Tuesday I was in Centerville, Tennessee, and ate at the Fish Camp Restaurant. 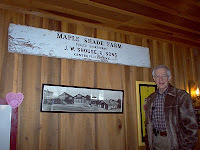 I noticed a sign on the wall, “Maple Shade Farm, Polled Shorthorns, J. W. Shouse and Sons, Centerville, Tenn.” Mr. Shouse and his sons used this sign to identify their livestock when they showed at the Hickman County Fair and the Tennessee State Fair. I had seen the sign the last few times that I ate there. I thought I remembered painting the sign for Wash Shouse. Wash was the brother-in-law of Minnie Pearl (Ophelia Cannon). This week, my daughter-in-law, Terri Barber, said, “There are small letters on the bottom of the sign – like a signature.” I walked to the sign and there was my name, painted forty-eight years ago: JERRIE BARBER. It brought back good memories of growing up in Shipps Bend. I used stencils and a very small paint brush. I worked slowly and carefully. It never occurred to me that I would see this sign nearly a half century later. I have asked myself many times since Tuesday, “What am I doing now that will be around fifty more years?”. Am I using the same carefulness and accuracy with which I painted that sign? Will the people who see and remember my work be proud to say, “I knew the man who did that”. “By faith Abel offered to God a more excellent sacrifice than Cain, through which he obtained witness that he was righteous, God testifying of his gifts; and through it he being dead still speaks” (Hebrews 11:4).